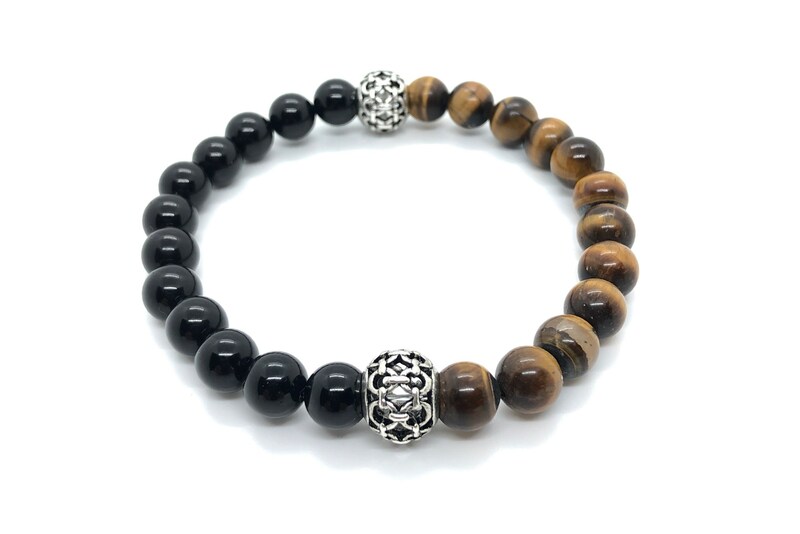 Bracelet "XANNA STONE MEN (21)"
Men's bracelet with onyx beads and tiger eye (8 mm) with silver bead. In antiquity was considered the stone misfortune, generated sadness, fears and hallucinations. It was also believed that he had a demon kept inside and that at night he went out to sow the discord. The name derives from the Greek word meaning fingernail. The story is that one day Cupid cut Venus's divine fingernails with an arrow while she slept, he left the cuts scattered over the sand, and fate turned them into stone so that no part of the divine body would ever die. It is said that Black Onyx promotes vigor, strength and perseverance, helps to learn the lessons by giving self-confidence and helping you to be in harmony with your environment, is a stone of protection, because of the way it repels and deflects negative energy. They are often used in meditation, to help people find a deeper spiritual connection and achieve balance. The Romans used the tiger's eye carved in their shields and breastplates as a protective symbol in the battles, in the Arab culture, used this semiprecious stone when they had to undertake a long journey. Before their departure they gave to drink to their wife a bowl of milk in which they had previously introduced a tiger eye amulet. It was thought that if the woman was unfaithful during her husband's absence she could not become pregnant with her mistress. In the Middle Ages he wore as an amulet against witchcraft, demons and evil eye. It is said that the tiger's eye helps to overcome difficult stages of our life, helps us to keep the perspective in, in complex situations, the tiger's eye is a protective stone, shows the correct use of power and makes us take out our integrity, helps to get Our goals, the Tiger's Eye remedies self-esteem problems blocking creativity, self-criticism. It differentiates idle thoughts about what you want from what you really need.